Shopping for Doc McStuffins Wall Murals? The Doc is in! Join Doc, Stuffy, Hallie, Lambie, and Chilly in the magical world of Doc McStuffins. 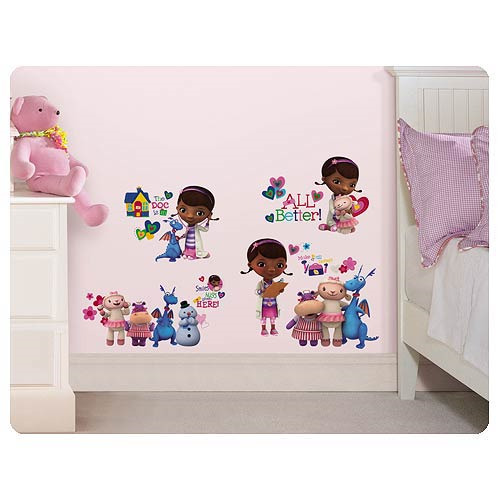 These Doc McStuffins Peel and Stick Wall Decals are tons of fun and will delight little ones who are all about fixing toys and staying healthy. Each of the included elements are pre-cut, removable, and repositionable. They're easy to apply, and can be moved around at any time, or even placed back on the liners for storage. They're easy to use and sure to delight! Decals measure between 2-inches tall x 1 4/5-inches wide and 12-iches tall x 9-inches wide. Ages 3 and up.